We know you as a great writer and a Chief Content Officer on MarketingProfs🙂 But, for our readers who are not completely familiar with you as we are, could you share a word or two about your work? I’m the first Chief Content Officer on the planet. I’m a Wall Street Journal bestselling author (of Content Rules and Everybody Writes). I’m a mom to creatures both two- and four-legged. I speak all over the world about marketing and business. And I’m a Scorpio. A well-known fact is that you always wanted to be a writer. But when and how have you developed an interest in content marketing? When I was 8 years old, I wrote in my diary that I wanted to be a “writter.” But even at that age I wanted an audience—someone to write to. I craved community, comments, interaction. The Internet hadn’t happened yet. As a kid in the Boston suburbs, my ability to build an audience was limited. So I created a neighborhood newsletter, which I delivered on my bike to my neighbor’s mailboxes. When I got older, I wrote to a bunch of pen pals around the world. And because my life was pretty boring, I invented new lives for myself and wrote about them to my pen pals. I researched places I’d never been and things I’d never seen. I wrote about the life I didn’t have. It was entertaining. It was content. Even if none of it was true. What I love about having an audience is that ultimately you are a teacher: You are helping people make sense of news or ideas. That’s what led me to content. 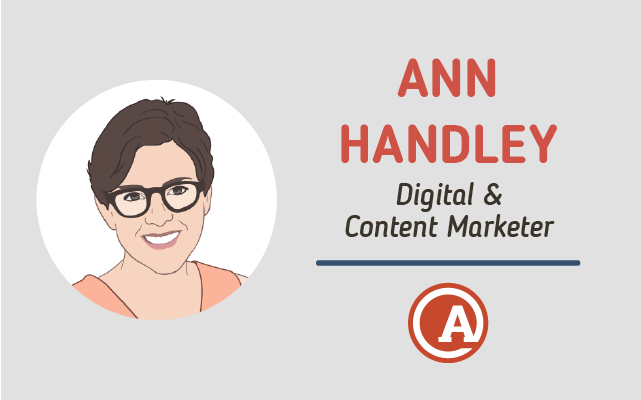 As a content marketing pro, we assume you’ve seen it all so far…From your experience, what are the three worst mistakes a business can make when it comes to content marketing? 2. Not being bold or brave enough. 3. Not telling a big enough story. Blogging and storytelling – would you say these are the most effective marketing tools any online business should practice today? And why? I tend to avoid binary statements like “any online business.” Most? Yes. But not all. There’s an exception to every rule. Blogging is just one route you can use to tell your story, by the way. That might be the best way. Or it might not. You might instead decide that your audience is better served by a podcast, video, or puppet show. The tactics don’t matter as much. What matters whichever you choose is best suited to your audience. You also run a personal blog – how much time do you spend blogging (the whole process of creating a post, research, etc) and where do you find your inspiration? I love my personal blog, and I use it as a playground more than anything else. And because I don’t have a lot of time to work-play… I don’t blog there often. I write lots of other places, though (for IBM, for example). I’m a notoriously slow writer, so I’m not sure my benchmark is that useful: But I probably spend a good 8-16 hours on writing and researching a post before I publish it. I keep a running list of things I want to write about in GetPocket and Evernote. I use Trello and CoSchedule to organize myself. I get inspiration literally everywhere. The difference between having a wealth of ideas to write about and having zero ideas to write about is training. Train yourself to catch for those inspired moments. And then train yourself to have the discipline to write them down. 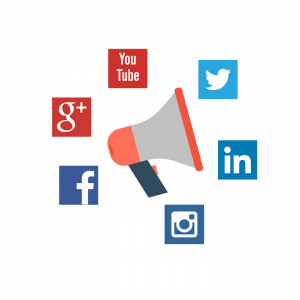 Which social media sites do you consider the most important and how do you divide your time up between them? I love the serendipity of Twitter (https://twitter.com/MarketingProfs). To me there’s no other social platform that offers the same ability to tap into a global conversation. It also drives a lot of traffic for MarketingProfs, because I have a lot of followers there. And I have a lot of followers because I’ve invested in it. See sentence #1 of this paragraph! 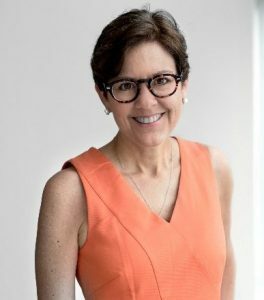 From a personal point of view, I love Instagram (https://www.instagram.com/annhandley/). What are your top three plugins/tools, the ones you can’t live without? You published a book on writing, named ‘Everybody Writes’ – could you tell us a bit more about it? What makes your book a ‘must read’ piece of content? 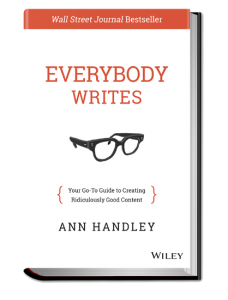 Everybody Writes is a modern writing and storytelling guide for content creators. I could tell you why should buy it, or you could go on Amazon and see what people think of it there. Or check Instagram, because it gets a lot of reader love there, too! Do you have any other advice for content creators who are just starting, any rookie mistakes they should avoid? Don’t worry about mistakes. Just start somewhere. Create with a generous and giving mindset for your audience. You’ve got this! We always wrap up with a bit of fun, so as a writer if you had to choose, whose honest critic of your book, living or dead, would you love to receive – regardless of its nature (positive or negative)? Roald Dahl. One of the greatest storytellers of all time. Also EB White, because his Elements of Style was in many ways the inspiration for Everybody Writes!